The Aaron Derm 102 Diathermy is a new cost effective 10 watt high frequency Diathermy and Desiccator designed to perform in house minor skin procedures including removal of skin tags, benign lesions and premalignant lesions. 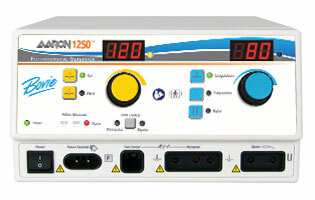 Derm 102 has all of the functionality of a larger diathermy with power control on the pencil handle and the option of both mono-polar and bi-polar mode. 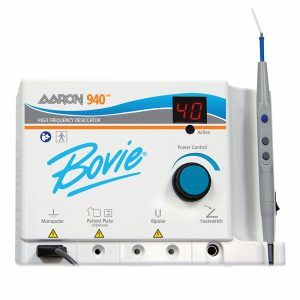 The Bovie Derm 102 diathermy as with all the Aaron range comes ready for use with hand-piece, electrodes, wall mounting bracket and an instruction DVD so that it is immediately ready for use. 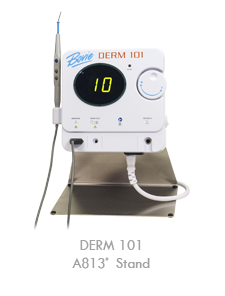 The Derm 102’s digital power control system allows you to change from low to high by simply pushing the up/down buttons on the hand-piece or rotating the power control knob. If you need to use a foot control just plug it in. There is no need to purchase an expensive separate hand-piece for foot control situations. The same auto-clavable hand-piece that normally operates the unit allows for foot control activation and still retains the ability to activate the unit or adjust the output power via the up/down buttons. 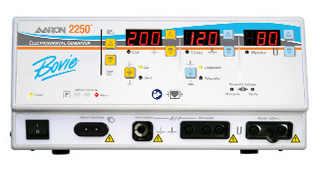 Means unsurpassed safety for you and your patient. The Derm 102 continuously monitors every aspect of the output. At the first sign of any problem the machine instantly disables the output and displays the appropriate error code on the display. A major part of the goal in designing the Derm 102 was to make our high quality Bovie range available in a low cost, lower wattage design. Derm 102 is the most affordable product in our range, we think that it is one of the best value options available with the pricing putting it within reach of all practices.